To better comprehend microbial invasions, researchers need more insight into how environmental conditions affect biogeographic patterns in microbes. 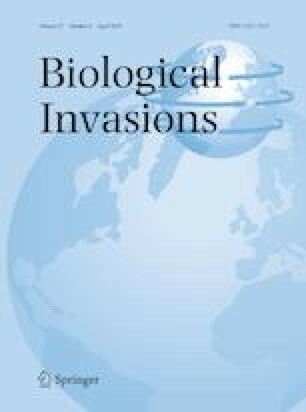 Recent study suggests that environmental conditions are important predictors for when invasive microbes might become established, actively participating members of a community, but that dispersal also can be important in determining invasion success in conducive environments. In this study, we explored how detection limits affected the ability of a local-scale environmental model to predict the presence of the putative microbial invader Prymnesium parvum at a regional scale. The local-scale model was robust when applied to the regional dataset. Regardless of sensitivity (i.e., minimum detection limit used), P. parvum presence was well predicted by environmental parameters. The highest accuracy was obtained at a detection limit that corresponds with detection limits routinely achieved using standard microscope-based analysis, while lower detection limits typical of molecular approaches worsened the model’s predictive capabilities. Although many mechanisms may be limiting our ability to predict P. parvum presence at low abundances (e.g., dispersal, source-sink dynamics, methodological limitations), we argue here that environmental filtering plays a role in regulating population growth above these low abundances. The importance of environmental traits in predicting the presence of this microbial species suggests that environmental conditions are critical determinants of the establishment and spread of P. parvum. The online version of this article ( https://doi.org/10.1007/s10530-019-01977-z) contains supplementary material, which is available to authorized users. We wish to thank E. J. Remmel, K. L. Glenn, J. D. Easton, A. C. Easton, B. Allison-Witt, T. C. Hallidayschult, J. F. Hayworth, R. Cothran, C. Miller-DeBoer, F. Acosta, and the University of Oklahoma Biological Station (UOBS) administrative and facilities staff for support in many aspects of this project. The manuscript also benefited from comments and discussions with L. J. Weider, M. Kaspari, B. J. Stephenson, J. Hawthorne, and members of the OU Ecology and Evolutionary Biology journal club. Funding was provided by a Grant from the Oklahoma Department of Wildlife Conservation through the Sport Fish Restoration program (Grant F-61-R) to K.D.H. and UOBS Graduate Research Fellowships to R.M.Z. and J.E.B. Data presented in this article were included in work submitted by R.M.Z. as partial fulfillment of the requirements for a Ph.D. degree from the University of Oklahoma.